Every time winter rolls around and rears its ugly head, we begin to talk about dry, flaky skin. How to prevent it. How to treat it. Best product recommendations. Etcetera. Now, I normally have combination skin with one pretty oily T-zone. Recently, however, whether it’s due to the dry air in my apartment (I need a humidifier, I know) or potentially over exfoliation on my part (wince), my skin was flaky EVERYWHERE. My forehead, cheeks, chin, nose, and around my eyes. It made wearing foundation or concealer absolutely impossible. Lest my face look like paint chipping off of an old house. Gross. So I went searching through what many truly addicted beauty junkies have stashed in a closet somewhere…. a bin. Not just an bin, but a bin filled with samples, full-size products we stocked up on, and our slew of face masks that we pull out every so often to treat our truly-debilitating skin woes. Well, at least they FEEL debilitating. After trying several samples over the week, including layering trusty, old Aquaphor all over my face, nothing was making a dent in my poor, parched skin. I was at my wit’s end. Fear not, my friends. For I found yet another sample in my handy-dandy bin that changed everything (wow, why am I super dramatic in the most. Maybe because I saw a Shakespeare performance the other day. Note to self, I am not Shakespeare. *puts down quill*). 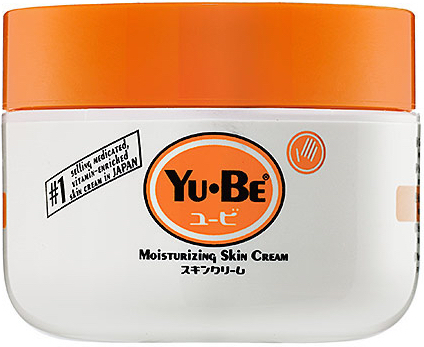 I found a long-lost sample of Yu-Be Moisturizing Skin Cream. I squeezed out a tiny glob of this pearlescent, pastel-yellow formula onto my fingertips. It was pretty darn thick. I rubbed it over my skin after I’d applied all of my toner, serum, and other treatments. The first thing I noticed, besides the yellow color, was the smell. It has camphor in it to help “soothe” skin, I guess. To me, it just smelled like VapoRub. And it was not good. The packaging claims the smell does fade, and I believe it did. To be safe, though, I wouldn’t recommend slapping some on and running out the door. You might cause people to have flashbacks of lying in bed with a chest cold. No bueno. Anywho, I put this stuff on before bed and when I woke up, holy moly. The flakes were gone! My skin felt quenched, looked plump, and felt supple. Nothing I’d used up to this point worked. I’d layered serums packed with Hyaluronic Acid, face oils, and moisturizers packed with humectants. Nothing worked. So I looked at the ingredient’s list for this Yu-Be miracle product. Unlike other moisturizers out there (aka MOST moisturizers out there), Yu-Be lists the powerful humectant (which draws water into the skin) as its very first ingredient, meaning its main ingredient is glycerin. When I researched other products, the best I could find was glycerin listed as the second ingredient. It really makes a difference having a formula so packed with glycerin. It worked better than mineral oil or petrolatum, which are also not great to use because they can cause breakouts. Yikes. Better yet, the 2.5 oz jar is only $25. It’s not dirt cheap, but the new Neutrogena Hydro Boost Water Gel costs $19 for 1.7 oz. So Neutrogena actually costs more per ounce than Yu-Be. Score! While it’s only 2.5 oz, this stuff is thick. You really won’t need much to cover your face. Plus, if your face only occasionally gets dry, just use it at night or when needed. It’ll last you a very long time. So, if you’re suffering from severely dry skin due for any reason try Yu-Be. Not only does it work better than anything I’ve tried, it also works fast and doesn’t cause breakouts like other heavy creams can. Huzzah!